Politics: Will we see this one day in Singapore? Picture from the BBC: Economy woes shake up Canada poll - 13 Oct 2008. 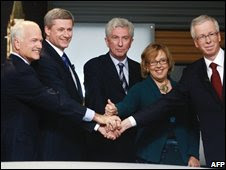 From left to Right: Jack Layton (New Democratic Party), Stephen Harper (Conservative Party and current PM), Gilles Duceppe (Bloc Quebecois, who would have Quebec leave Canada if they could help it), Elizabeth May (Green Party) and Stephane Dion (Liberal Party). A picture of 5 leaders of the major political parties in Canada (including the Green Party led by Elizabeth May with "merely" one seat). Whatever their differences are, they are willing to pose for a picture together in relative harmony. I may be wrong, but this is at least an indication that they are trying to put forward the impression that country comes first. I remember reading a comic by a local Singapore artist a long long time ago who drew an image of Lee Kuan Yew, J B Jeyaratnam and Chiam See Tong toasting and drinking together at a parliament cafeteria (I think) after a hard day's work at Parliament. He was musing and thinking aloud something to the lines of "wouldn't it be great if our ruling and opposition politicians could get along like this?". With the passing of JBJ, that image will always remain fiction. Perhaps one day ... we can have politicians who are at least civil and respectful toward one another in private life. I am only 36, but perhaps it is saying something when I say I do not believe I will ever see a day when this happens, *even if* the opposition somehow wins in Singapore. Too much bad blood.